We don’t deserve nice things. Not in this state. Not in a state where voters routinely reward the pandering foolishness of conmen. Alabama’s attorney general — the man who appears to be leading in the race to retain that office — provided a master class last week in all that is wrong with Alabama politics. Early last week, Marshall wrote in a letter to the chairman of the West Morgan East Lawrence Water and Sewer Authority promising to look into issues with pollution caused by a 3M plant in nearby Decatur. Marshall’s letter came in response to a letter from the WMEL, asking that Marshall, on behalf of the State of Alabama, join a lawsuit against the company. Marshall claimed that it was the first he had heard of the problems, and that the WMEL letter was the first time he had been asked about the pollution problem — a problem so dire that thousands of residents aren’t drinking their tap water. Now, let us be clear about one thing: That is an absolute lie. 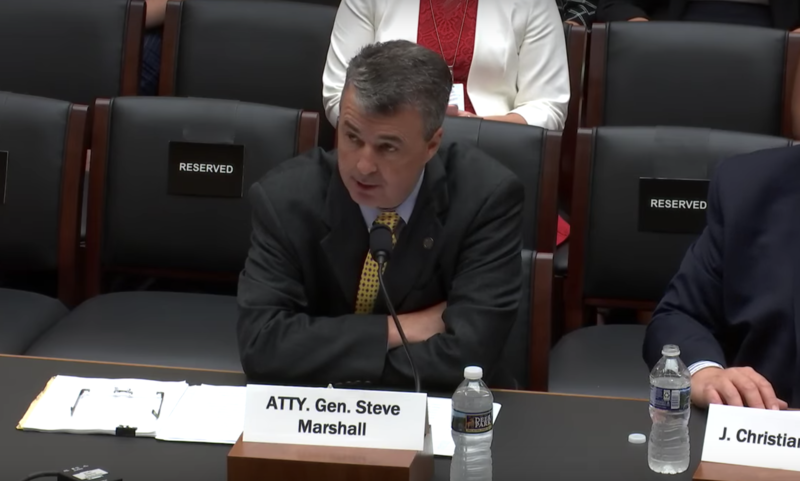 Steve Marshall was told of these problems months ago, and an attorney representing the water authority has the receipts to prove it. But for a moment, let’s set that aside. I’ll get back to it later. For now, let’s move on to later in the week. On Friday, Marshall’s office sent out a press release announcing that Marshall was leading 13 states in filing a brief about a cross being removed from a park in Pensacola, Fla. The release went into some detail about how this historic cross came to be, and it recounted the numerous events held by townspeople in Pensacola in front of that cross. And this — this right here — is why we don’t deserve nice things. Because the Alabama attorney general believes it to be more politically advantageous to educate himself and file briefs about a cross in another damn state than he does to insert himself in a problem that has led to thousands of his constituents being unable to drink their tap water. How can it be that the majority voters of this state are more concerned about this pandering nonsense in another state than they are about one of this state’s major waterways and thousands of good people dealing with the effects of poison water? And you know, don’t tell me that’s not true, that voters really do care. Because I know it’s true. Year after year after year, the Tennessee River and other waters in this state become increasingly more polluted by the industries that dump their waste into them, and this state’s citizens — allegedly filled with avid and serious fishermen — continue to elect politicians who do absolutely nothing to stop it. And even worse: They elect people who help facilitate the pollution. Which brings me back to Marshall’s claims of being totally unaware of this problem that has been going on for three-plus years and affecting thousands of people and reported on extensively by pretty much every media outlet in this state. Carl Cole, an attorney for WMEL, posted on his Facebook page last week details of the ongoing case. In doing so, he revealed two key things: 1. That former AG Luther Strange and attorneys from his office had held numerous meetings with the parties involved and were actively engaged when Strange was appointed to the U.S. Senate, and 2. Cole personally informed Marshall of the case and asked the AG about his plans during one of Marshall’s trips to Decatur several weeks ago. There is zero chance that no one at the AG’s office mentioned this ongoing case to the incoming AG. And even if that did happen, there was an attorney informing Marshall of the case this past summer. And still, Marshall did nothing. Until a reporter showed up to ask questions about it, at which time Marshall’s office threatened the reporter and tried to have her removed from the story. This is the guy who is the frontrunner in the AG’s race. And this is why we will never, ever have nice things.